The Bank of Japan is sitting back for the ride. The central bank kept policy unchanged on Nov. 1, even as it trimmed inflation forecasts. Adding extra stimulus weeks after introducing a new, yield-focused framework would look nervous. The BOJ also needs something in reserve for potential upsets – like Donald Trump beating Hillary Clinton in next week’s U.S. presidential election. Few expected the BOJ to tweak the new setup, which involves holding 10-year bond yields at zero while selectively charging negative interest rates and buying about 80 trillion yen ($760 billion) per year of bonds. After all, the overhaul is aimed at sustainability: it lets Japan’s central bank keep juicing the economy for longer, without running out of bonds to buy or hurting financial institutions too badly. Nor is it surprising that the timetable for annual price rises hitting 2 percent has been pushed back yet again – BOJ Governor Haruhiko Kuroda now hopes to see inflation nearing that level in fiscal year 2018. A small cut to next year’s forecast for inflation, excluding fresh food, to 1.5 percent, is if anything milder than expected. 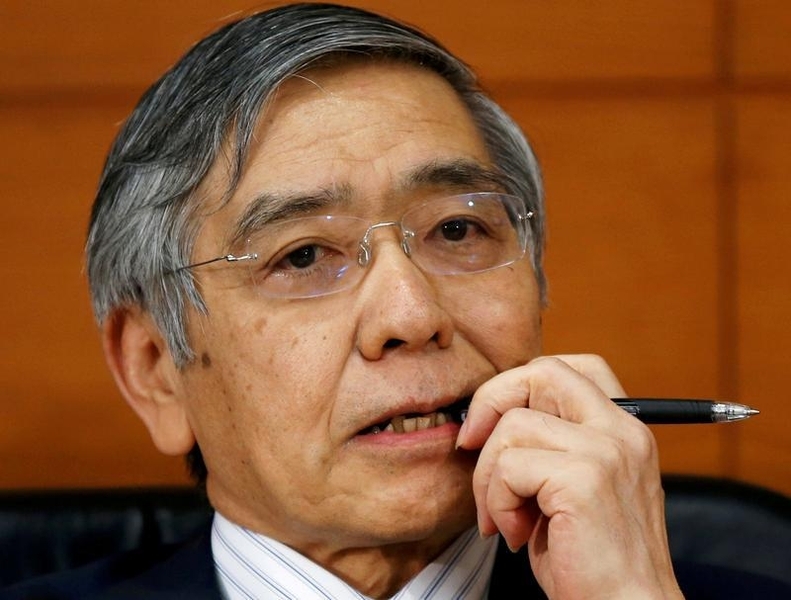 Kuroda also needs to keep his remaining powder dry. The bank’s economic outlook sounds gloomy, warning of risks to both growth and inflation. As well as geopolitical dangers, it is wary of Brexit fallout, weakness in the Chinese and U.S. economies, and Europe’s debt crisis. A shock like a Trump victory could send investors rushing for the perceived security of the yen, denting corporate profits and unhelpfully slashing import prices. To weaken the currency, the BOJ might then need to cut interest rates further below zero – even though the current token negative level of 0.1 percent, on just a sliver of deposits, has proved unpopular. In the very near term, there’s a U.S. Federal Reserve policy decision due on Wednesday, and another in December after the election. Further out, the market could pose other questions. Would the BOJ really sell lots of bonds if a “flight to safety” sent yields sharply negative, for example, or buy in massive amounts if for some reason there was a panic selloff of Japanese assets? For all the bank is holding steady now, it may need to be nimble again before too long. The Bank of Japan held off on expanding stimulus on Nov. 1 despite deferring the target date for hitting its 2 percent inflation target. The central bank signalled that it will keep policy unchanged unless a severe market shock threatens to derail a fragile recovery. In a widely expected move, the BOJ maintained its negative 0.1 percent interest rate for a portion of excess reserves that financial institutions deposit with the central bank. After its two-day policy meeting, the BOJ also left unchanged its 10-year government bond yield target of around zero percent. Most analysts recently surveyed by Reuters expected the BOJ to wait until 2017 before easing again. In a Sept. 30 to Oct. 10 poll, Reuters found about 70 percent of those specifying a timeframe thought the bank would add more stimulus no earlier than January.